NSW have won their second Super W championship, continuing an unbroken run of wins by teams from the State since the revival of inter-state XVs in 2015 after Sydney won a hat-trick of Australian Women's National titles from 2015-2017. In fact the Warraths - Sydney Warraths from 2015-17 and NSW Waratahs from 2018-19 - now have a five year 100% record, having never lost a match the the competitions revival. But this year's final was the closest ever. NSW won thrilling 8-5 victory over arch-rivals Queensland in the 2019 title decider in Sydney. In a rematch of last year’s epic grand final decided in extra time, NSW denied Queensland once again in a cracking advertisement for the game. Despite the low-scoring nature of the game, with only two tries recorded, the match was an entertaining spectacle with plenty of end-to-end attacking rugby and desperate scrambling defence. 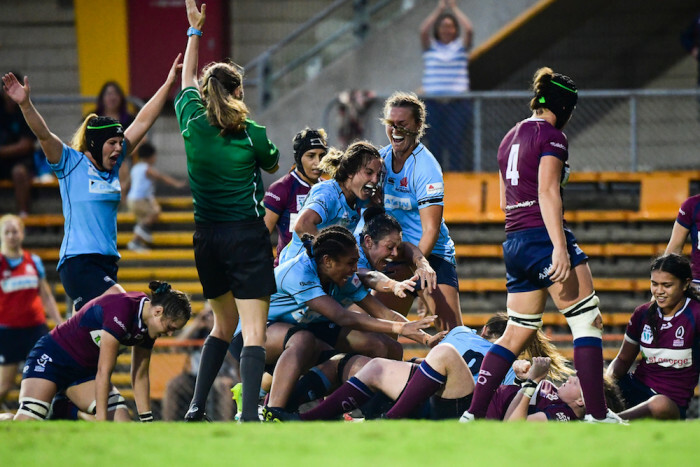 No 8 Grace Hamilton was enormous for NSW, running for a game-high 110 metres, bagging the match-winning try in the 55th minute and then pulling off a crucial turnover as Queensland attacked relentlessly at the death. Queensland fullback Lori Kramer was deadly every time she touched the ball, with winger Alana Elisaia also a handful as the Maroons threatened to end NSW’s unbeaten record since the competition began last year. A penalty from fullback and captain Ash Hewson earned NSW an early 3-0 lead in front more than 3000 spectators at Leichhardt Oval. The Waratahs lost winger Maya Stewart to the sin bin on the quarter-hour mark for an off-the-ball tackle on Queensland opposite Elisaia. Queensland cashed in on an overlap shortly after when Elisaia touched down in the right-hand corner for her seventh try of the season. Despite a glut of possession and territory, it took NSW more than half an hour to reply as some fancy footwork from centre Katrina Barker helped put Hamilton over for what ultimately proved the match winner for the Blues. Fittingly, veteran Hewson had the last touch of the match, booting the ball into the stands to clinch victory before being chaired off by her teammates and named as player of the tournament. “She’s a legend,” said prop Emily Robinson.